When you think of owning a home in Colorado, you probably envision a home like the ones found in Northwest Colorado Springs. Backed up against the mountains this area features stately middle and upper middle class homes nestled within the scenic pine canyons. There is an intruiging combination of stately homes built in the 70's and 80's in the Rockrimmon area right next to homes that were built within the last ten years in neighborhoods like Pine Cliff and Golden Hills. The median price for homes here is $281,800 and there is a population of 26, 590. There are a number of neighborhood parks intersperesed throughout the area, as well as Ute Valley Park with scenic rock cliffs and miles of trails that feature some of the best mountain biking in the area. On the east side of the area runs the Sante Fe trail, providing wooded hikes along Fountain Creek and up into the Air Force Academy where wildlife sightings are common. The Castle at Glen Eyrie is located to the southwest, right next to the spectacular Garden of the Gods. Centennial Blvd to the west side of this area provides access to the Garden of the Gods retail and office corridor. To the north is Woodmen Rd which provides easy access to I-25 and the Air Force Academy and northend shopping and restaurants. Rockrimmon blvd loops through the center of the area, allowing easy access to shopping centers and schools within the area. With its spectacular views, regal neighborhoods, amazing outdoor opportunities, great schools and easy access to some of the best shops and restaurants in the area, Northwest Colorado Springs is a great place to call home. 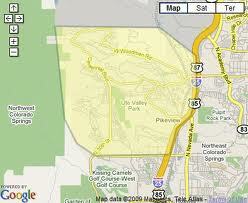 Click on the map below to search for available real estate in Northwest Colorado Springs. Search the #1 site for Northwest Colorado Springs Real Estate listings.